A unique movie that finds the right balance of comedy and drama as it takes on the story of a politician who has trouble with his public speaking. The King’s Speech is a movie about a man who is the King’s son, perhaps aspiring to the role of King, but for one problem. He can’t talk. He can’t say more than a few words without stuttering very badly. It’s a major problem for such a public figure. Especially in the days that proceeded World War II, where radio had just been invented and the future king would be required to make public broadcasts to the people. 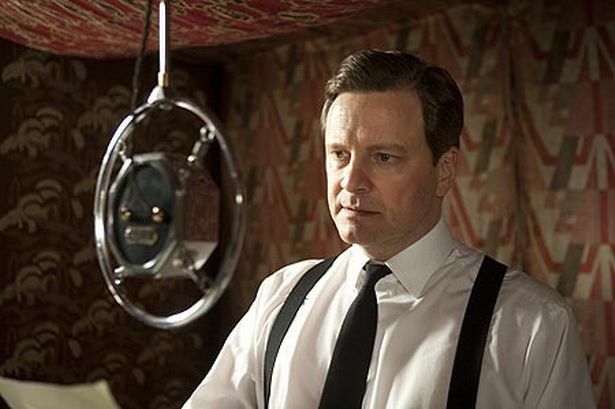 This man of royalty is played by Colin Firth and it’s a pretty terrific performance. The stuttering, the frustration, the lack of confidence and fear of what he needs to do all come through with his acting. He’s a man with terrific ideas, and no way to communicate them to the people. His wife, played by Helen Bonham Carter in one of her better roles (good thing she took a break from working with her husband Tim Burton), looks for someone who might be able to cure him. At the start of the film, he’s with a doctor who has him put marbles in his mouth and insists he annunciate his words. It’s pretty ridiculous and as such, pretty funny. Carter finds Geoffrey Rush, a man with strange notions and principles. Rush insists that whoever his patients be, no matter how powerful, they must come here, to his office. Anybody else in the world would have relished the opportunity to come to Buckingham Palace on a regular basis and get treated like a king. But Rush has other ideas in mind. He wants to help his patients and perhaps cure them and can only do that if he is in complete control of what he does with them. Rush has a lot of fun with Colin Firth. There are humorous montages devoted to the ridiculous things they do together. One great one, that starts it all off, involveds Firth speaking into a recorder with music playing in his headphones so loud that he can’t here himself speak. He ends up speaking flawlessly. Rush teaches Firth all kinds of tricks and it’s quite amusing watching them. He teaches about pauses and positioning. He teaches about relaxing muscles and about confidence. And that’s all in the first third of the movie. After that we get into the politics of the royalty. As King Michael Gambon (fantastic actors in this movie) is on his deathbed, his two sons, Colin Firth and also Guy Pierce, are called in to possibly replace him. And there is conflict over this decision, mostly involving Pierce’s private life. Guy Pierce is an actor who chooses his roles very carefully. There was a time when he didn’t to be sure, making movies like Ravenous and The Time Machine, but since then he has gone on to cameo in The Hurt Locker and now be in this great film. And before these great movies and the lousy big budget stuff that came before them, he was in some of the better movies of our time. LA Confidential (His breakthrough) and then Memento (director Christopher Nolan’s breakthrough). Pierce is a good actor, but more notable are the films he chooses to be in, most of which are exceptional. The King’s Speech should be added to that list. The final third of the movie involves the big speech. The big climactic moment. World War II is looming overhead, Hitler is advancing, and something needs to be done. Geoffrey Rush is in fantastic form, upping the ante with his character, pushing all of Firth’s buttons, more and more, as the movie goes on. By the end, he’s even sitting in his throne. The movie is fun and creative. It is humorous at all the right times and powerful at the others. The acting is top class. This movie and The Fighter are the two films of the year with the most acting nominations. Three apiece. And in both movies, all of the nominations are well-deserved. 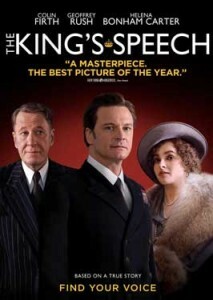 Best of all about The King’s Speech is the way it seamlessly merges humor with a political landscape. The second portion of the movie, with Guy Pierce and the questions of who will be the new King, is the weakest of the three parts, but it is also completely necessary. It makes the other two parts better, because it separates them and gives the story of the King and his speech making some space. There could have been more talk about World War II in it, about what Hitler was doing and what the hell was he thinking, and that would have certainly made it a more compelling film (something like Fail Safe), but it might have also taken away from the one man uncertain of himself idea. This movie wasn’t about England. It was about the King. And Colin Firth played him to perfection. It’s a very interesting and enjoyable film.